Farmers in Lebanon’s Bekaa Valley learn application techniques of the latest agricultural films. In an effort to enhance quality of fruit and vegetables in Lebanon, Masterpak hosted a best practices seminar for over 50 farmers, cultivators and agricultural supply traders from across Lebanon’s fertile Bekaa Valley. This timely and relevant seminar, which took place in Zahle on 20 March, focused on a topic that could improve future harvests: techniques for applying Masterpak’s agricultural films. “We want farmers to benefit from our films in the best way and ultimately to be as competitive in the market as possible,” explains Amal Merhi, Masterpak Marketing Manager. El Turk Agricultural Company, which coordinated the event, distributes Masterpak’s range of agricultural films in the Bekaa Valley: greenhouse covers, ground cover film, hydroponic gully film, low tunnel film, mulch film, silage film, soil disinfection film and water membrane. Ziad El Turk, Agricultural Engineer, warmly welcomed the participants and emphasized the benefits of the seminar. Masterpak personnel then launched the seminar. 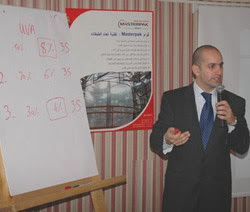 General Manager Wissam Moubarak explained the company’s role in developing and improving local agricultural production. Other trainers from Masterpak gave detailed presentations about the product range, technical specifications, uses, and quality of the films, as well as the company’s relationship with the local agricultural sector. Râny Sfeir, Agricultural Engineer at Masterpak, discussed growers’ needs and advised them to use specific products, depending on crop and climate, in order to optimize their crops. “We customize our agricultural films to satisfy your exact plantation requirements,” Sfeir explained. The training concluded with a Q&A session, followed by a lunch at the hotel. Masterpak plans to host this seminar for farmers, cultivators, and agricultural suppliers in other regions of Lebanon throughout 2007.